The State Route 121 Bridge (21 0009) is a two span stone arch over Capell Creek that was built in 1907. I've written before that I dislike two span arch bridges because they look like someone is staring at me. Like many of the other bridges in Napa County, it was rehabilitated in the 1950s with a reinforced concrete widening (see below). 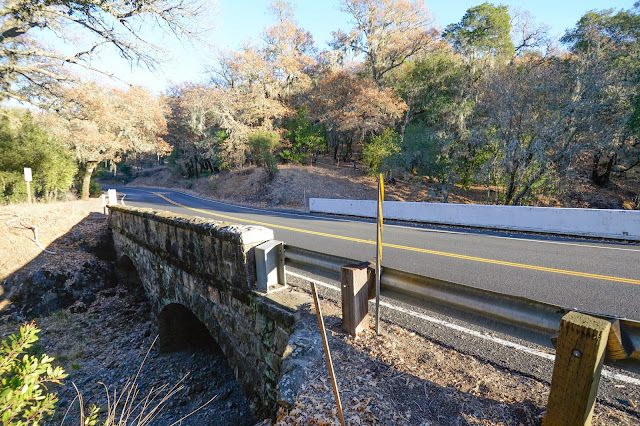 Napa County, California Bridges: State Route 121 across Capell Creek by Mark Yashinsky is licensed under a Creative Commons Attribution-NonCommercial-NoDerivatives 4.0 International License.